After a very successful show in 2018 Money For Nothing are back by popular demand. Featuring all the hits from their first ever single ‘Sultans of Swing’ to ‘Brothers in Arms‘, ‘Walk of Life’ and their last single released in 1992 ‘The Bug’ – also the legendary ‘Money For Nothing’ (ft Sting) which was the first ever video played on MTV. The band also include versions from ‘On the Night’ and ‘Live @ The BBC‘. 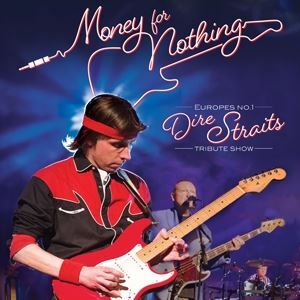 The Money For Nothing stage show has been performed all over Britain and the world, at all types of venues & events – from music festivals, theatres, nightclubs and venues. 2010 saw them headline the main night on Europes Biggest Tribute Festival. The band have also had the pleasure of performing as show opener for the legendary Roy Wood on part of his Theatre Tour. Sept 2011 saw them take their show to India to perform at a sell-out concert where they headlined an event held at one of Bangalore’s largest Amphitheatres. Their special appearance was featured in the worlds largest selling English-language daily newspaper, The Times of India.